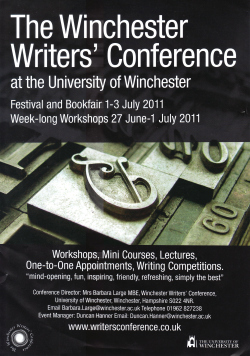 You can read Winchester Writers’ Conference, 2011, Part One: Characters here. If you want to be a writer, you need to read. And don’t just read, think. What makes a book good – or bad? What grips you – or makes you put it down? Try photocopying passages so you can annotate them. Good characters have powerful ambitions or longings. Their goals need to be acted out on the page – they can’t be purely internal. Prompts – whether written or visual – can help you get started. You might like to put together a collection of photos/images or find some writing exercises to try. The mood of a piece helps determine the meaning. Consider the location it’s set in, and the sorts of words that you use to describe the place and the people. First, I’m going to cover some of the tips I picked up in a workshop with Paul Bavister, a poet and a creative writing tutor at The University of Reading and at Birkbeck College, London. At the Winchester Writers’ Conference, Paul delivered a workshop on Developing Fiction Writing. It covered a range of areas, but I’m going to focus here on two sections: planning and what makes a bad piece of writing. It’s a good idea to write a plan or synopsis before you start – that way, you can spot potential problems sooner. The first decision you’ll need to make is about viewpoint; first person (I) or third person (he/she). If you’re going to make unusual structural decisions, like having several first person narrators, do it for a reason. There are plenty of different plot types: most stories are either about going away or coming back (in a literal or metaphorical sense). Of course, you can blend these plots, especially in a novel. A theme gives shape and purpose to what you’re trying to write; the plot is the illustration of the theme. Themes often emerge during novels and may not be obvious at the start. Authors have different approaches to planning: some like to create characters and set them loose, rather than working out a detailed plot. It’s best, though, to have some level of planning as part of your creative process. I enjoyed Winchester, as usual. But I felt that, despite the high-quality of the sessions, I wasn’t learning all that much. I guess that, after four years at the conference, plus a creative writing MA, plus extensive feedback from workshop groups … I’ve mastered more than the basics. So, next year, my goal is to be a speaker at Winchester, not just a delegate. I’ve got a wealth of experience in the online world – blogs, social media, ebooks, ecourses – and this is an area of huge interest to writers, as well as a rather scary prospect for many. I’m hoping to pitch a session or even a short course to help writers to not only demystify the online world, but to get excited about the opportunities it offers. I’m also looking into doing more speaking generally: I’ve submitted a proposal to BlogWorld LA and will let you know how that goes! Thanks for sharing what you learned–great stuff! I haven’t tried fiction in years, but this post and Part I made me realize I’m still interested in it. Good for you for deciding to try speaking next year–I’m sure you’ll rock! Yay! I’ve gone through dry spells of no fiction writing, but I’ve always come back to it eventually. Hope you will too, when the time is right! Thanks for posting this two part series. I recently subscribed to your blog, and already I find it quite entertaining and useful. Do it do it do it! No need to ask anyone for permission. I think you have many things to share to the conference participants. I know I’ve already emailed you an answer, but I want to to comment on here and say you really should try speaking next year, like all the people before me, I’m sure you will do awesomely! Thank you so much for having this blog and writing about writing! Yes, you are more than qualified to be a speaker Ali– enjoy! I have to respond to the “plenty of dialogue” advice cited by the editor who spoke. As an editor and writing mentor (years of experience) and fiction reader (decades), I realized a while ago that excessive dialogue, say over 50% of the average page based on quick page flip through book, usually means the book won’t engage me enough to read it all. Of course there are authors who can use a ton of dialogue and still reel me in, but I find fiction with a high proportion of dialogue often is weak. Anyone else feel this way? Interesting points about dialogue. I think it can get overused in certain genres (perhaps thrillers?) to try to create pace that’s maybe not quite warranted. Personally, though, I like a fairly high percentage of dialogue — so long as it’s well-written. Badly done dialogue really grates.